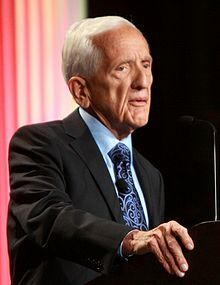 T. Colin Campbell (born January 1, 1934) is an American biochemist who specializes in the effect of nutrition on long-term health. He is the Jacob Gould Schurman Professor Emeritus of Nutritional Biochemistry at Cornell University. Campbell has become known for his advocacy of a low-fat, whole foods, plant-based diet. He is the author of over 300 research papers and three books, The China Study (2005), Whole (2013) and The Low-Carb Fraud (2014). Campbell was one of the lead scientists of the China–Cornell–Oxford Project, conducted throughout the 1980s. We're basically a vegetarian species and should be eating a wide variety of plant foods and minimizing our intake of animal foods. … Usually, the first thing a country does in the course of economic development is to introduce a lot of livestock. Our data are showing that this is not a very smart move, and the Chinese are listening. They're realizing that animal-based agriculture is not the way to go. … Ironically, osteoporosis tends to occur in countries where calcium intake is highest and most of it comes from protein-rich dairy products. The Chinese data indicate that people need less calcium than we think and can get adequate amounts from vegetables. Reported in "Huge Study Of Diet Indicts Fat And Meat" by Jane Brody, in The New York Times (8 May 1990), p. 2. Our study [China Diet and Health Study] suggests that the closer one approaches a total plant food diet, the greater the health benefit. … It turns out that animal protein, when consumed, exhibits a variety of undesirable health effects. Whether it is the immune system, various enzyme systems, the uptake of carcinogens into the cells, or hormonal activities, animal protein generally only causes mischief. High fat intake still can be a problem, and we ought not to be consuming such high-fat diets. But I suggest that animal protein is more problematic in this whole diet/disease relationship than is total fat. No chemical carcinogen is nearly so important in causing human cancer as animal protein. Editorial for the newsletter New Century Nutrition, December 1995; quoted in A Vegetarian Doctor Speaks Out by Charles Attwood (Prescott, AZ: Hohm Press, 1998), p. 133. This page was last edited on 14 June 2018, at 13:49.